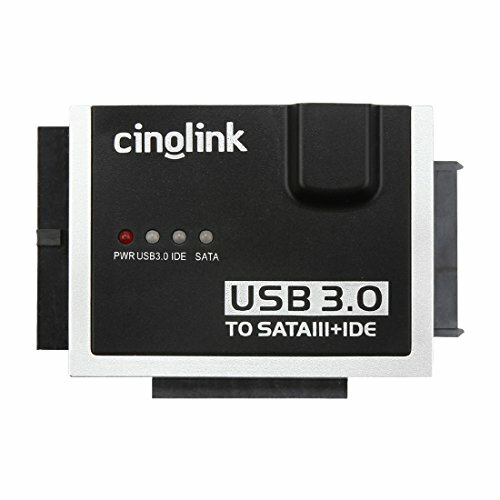 [UL/FCC Certified Power Supplier] Cinolink USB 3.0 to SATA and IDE Hard Drive Adapter Universal 2.5/3.5/5.25 Drives, with 4 Feet (1.2 Meters) USB 3.0 Cable | Replicafer Co.
Connect any 2.5″ or 3.5″ IDE/SATA or Serial ATA/SATA Hard Drive externally to your computer through an available USB 2.0/3.0 port. The Cinolink HA007 Adapter is a caseless solution that makes swapping hard drives easier than ever before. Transfer data quickly and easily through USB 3.0 at speeds of up to 5Gbps, up to 10xfaster than USB 2.0! Installation is simple and driverless, and LED lights indicate activity to confirm data transfer. One solution for all types of hard drives make this a perfect solution for data transfers or data backup. LED Lights indicates Power and USB 3.0/ IDE/SATA LED Show Status. Don't worry about your hard drive destroyed!! Ship next business day! 24 * 7 Email Support! Free Lifetime Technical Support and 24 Months Warranty from Cinolink. If you have any questions about this product by Cinolink, contact us by completing and submitting the form below. If you are looking for a specif part number, please include it with your message.